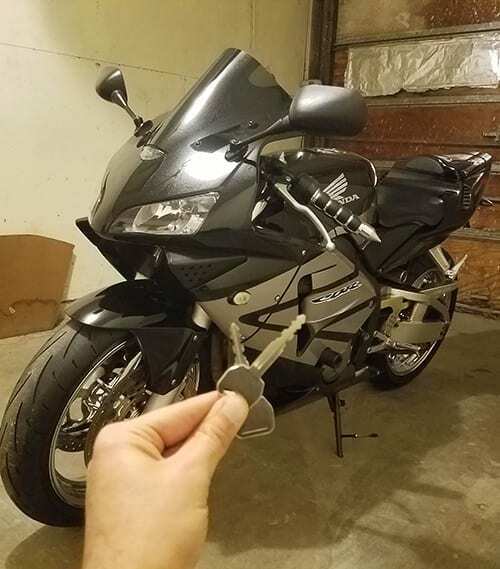 All motorcycles require keys, which is why when you have broken or lost your motorcycle key, you need the help of a professional locksmith who can make a new key for you right away. Extra Locksmith has a large selection of Dallas motorcycle keys. By keeping our contact number handy, rest assured our customer service team will send the right locksmith. Expect them to arrive in about 20 minutes or less. Our fully licensed, bonded and insured emergency locksmiths will make a new key for your motorcycle on the spot so you can get back on your bike and enjoying riding. Unless you have a remote start, starting your motorcycle requires a key whether you own a brand new Kawasaki or a vintage Harley. Whether you have a barrel key, double sided or single sided key, our highly experienced locksmiths have you covered! From break locks to gas cap keys and even seat keys, our motorcycle locksmiths can supply you with a new key. Since offer mobile service, our professional locksmiths can easily arrive at your location and perform the service needed to be done right on the spot. Call us or stop by for all your Dallas Motorcyle keys. In addition to making new keys for your motorcycle, our locksmiths also provide Dallas motorcycle key duplication service, replacement or can rekey your ignition. Install new locks for your breaks, gas cap, seat or forks. With all the parts and tools needed, we assure you that we only use the most advance equipment and supplies so that we can help you out swiftly no matter what model of motorcycle you own. NEED AN AUTOMOTIVE LOCKSMITH IN DALLAS? If you find yourself with your motorcycle keys broken or stuck inside the ignition, call our motorcycle locksmith right away! We have specialized tools to take out the broken piece without causing damage to your motorcycle. In case we need to replace the ignition our professional locksmiths carry high-quality replacement ignitions. We also provide duplicate motorcycle keys on the spot with affordable options. If you just bought your motorcycle, it is recommended to get the ignition and other locks rekeyed in order to make sure that you are the only one with keys. In most cases, our highly trained and experienced locksmiths can easily rekey the locks and give you a new key. In rare instances where we need to change the entire ignition or lock, our locksmiths can do so without causing any damage to your motorcycle. Which is why so many people choose us for their Dallas motorcyle keys. Aside from motorcycle locksmith services, our locksmiths are also expert in providing high-quality Locksmith services In Dallas so whenever you need our service, call Extra Locksmith right away and we will be there at your side in no time.